As a clinical ethology center, led by a professional with a veterinary degree specialized in this field, it is of great importance to observe animal behavior as a starting point and reference before any other intervention takes place, thereby realizing a thorough evaluation to know the customer and the dog or cat in everyday situations and environment. We are constantly updating our knowledge. Our treatments for dogs and cats are made both innatural environments and in the client’s house with any kind of stimuli, since our goal is that the animal learns to manage any circumstances inan adaptive manner on their own; instead ofcoercively inhibiting their behavior. The practical application of learning theories and behavioral knowledge is done throughout the process in order to improve diagnosis and treatment, as well asto provide results based on clear improvements in communication and behavior. Timeline: Precursors of the Ethology, Animal education and Training. We share the following timeline for you to observe the development of theories and research techniques on behavior modification. 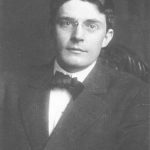 The twentieth century is known for the beginnings of two attempts to understanding human and animal behavior: Ethology and Behaviorism. Biological and comparative study of behavior, or how the animal interacts with its environment. C.O. 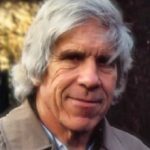 Whitman takes the first steps in understanding biological behavior to show what hecalled instinctive behavior, which was tobe developed in line with morphological structures. 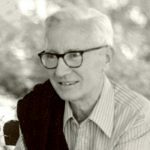 W. Craig creates the appetitive behavior and consummatory model, according to which part of the behavior (appetitive behavior) would be variable and searched; while another part would terminate the sequence of innate structure (consummatory act), and would be carried out in response to the stimulus. Oskar and Magdalena Heirnoth published Birds of Central Europe. They demonstrated the existence of fixed behaviors and features of each species, inherited from the parents, and clearly identifiable from the behavior acquired by learning. 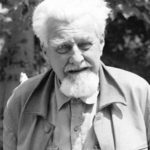 Konrad Lorenz introduced the “Fixed Action Guidelines” concept, and published Energy Specific Action (1937) and Innate Trigger Mechanism (1950), where fixed patterns of behavior are triggered in the presence of certain stimuli. What is its evolutionary origin? (Phylogeny)? 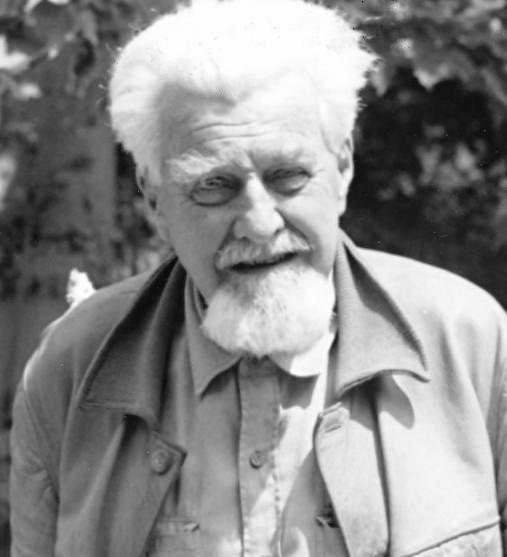 Konrad Lorenz, Karl von Frisch and Nikolaas Tinbergen won the Nobel Prize for developing the study of Animal Behavior or Ethology. Lorenz is considered the “Father of Ethology”. Species-specific behavior: typical and exclusive chances of a response in a species or group ofspecies. The behavior is biologically determined. Instincts are considered unchangeable neural structures, in which learned behaviors merge with individual experiences. Biological and comparative study of behavior, or how the animal interacts with their environment. From the evolutionary theories of Darwin, the animals become a model of study. 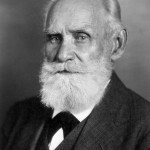 Ivan Pavlov began studying the salivary response and other reflexes in dogs. 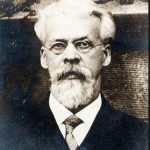 He develops the theory of Conditioned Reflex, in which an unconditioned stimulus is associated with a neutral stimulus that causes the subject to subsequently respond to the neutral stimulus with the response issued before the unconditioned stimulus (Classical Conditioning). 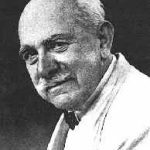 He developed the learning theory of trial and error: the behavior is not a simple response to a stimulus, but it also acts upon the environment. 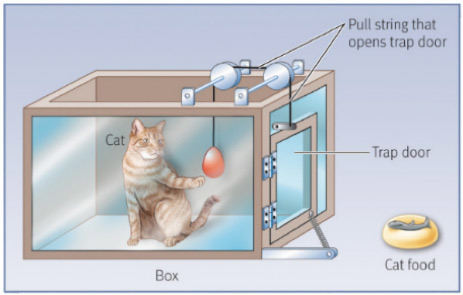 He put a cat inside a box where it could escape simply, but since there was no stimulus, it did not happen. An appetitive stimulus is added and the animals accidentally solves the problem. 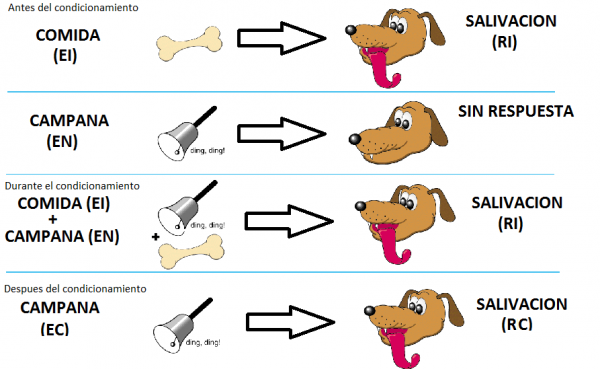 Facing the stimulus, the animal is able to solve the problem quicker over time (a behavior followed by a reinforcement tends tobe repeated). 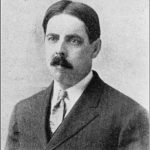 J.B. Watson is considered the founder of the school of Behaviorism. He affirmed the negligible influence of hereditary factors and highlighted the influence carried outby the environment. According to him, even emotional reactions are learned, just like any other reaction. Watson and Rosalie Rayner conducted the famous experiment “Little Albert“. It focuses on behavior while rejecting any mental aspects. 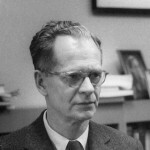 Skinner (1904 – 1990) Theory of Operant Conditioning: behaviors can be explained, predictable and controllable from the functional relationships with its environmental antecedents and consequences, rejecting exhibitions based on internal constructs. Animal behaviors are regulated by general laws. “Normal” or “abnormal” behaviors are acquired and may be modified in accordance with these laws. The goals of intervening with behavior modification techniques are implementing or reducing behaviors or replacing a behavior for another. The disorders are described in terms of relationships between stimuli, behaviors and consequences (E-R-C). Functional analysis is the basis of the explanation of the disorders. In Classical Ethology, the scientist goes and observes he animal's environment. 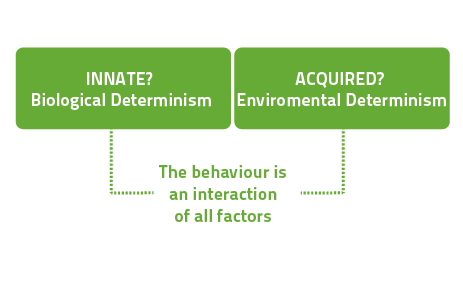 On the other hand,in Behaviorism, the scientist controls the environment and therefore modulates behavior. Behaviorists came to the opposite conclusion of the Classical Ethologists. 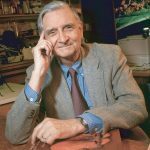 Starting in the fifties, the finding that the exclusive instinct and learning models did not respond tothe natural reality led to a certain rapprochement between the different tendencies of the study of behavior. Individuals, as “survival machines” in the service and under the control of the genes, would replicate them to a greater or lesser degree, depending on their own psycho-physiological effectiveness. Nowadays, the following issues receive special attention: development, neuro-endocrinology, learning, memory and cognition, as well as evolutionary issues related to reproduction (systems ofmating, mate choice, etc.) or social and environmental relations (aggression, intra and interspecies communication, etc.) and Applied Behavior (Production, Animal Welfare, Clinical Ethology).